Make sure your business is in compliance with the Americans with Disabilities Act (ADA) by training your employees to be aware of the regulations. 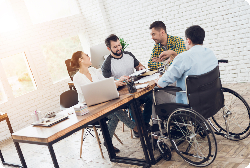 In this online training module, employees learn about the ADA and how to welcome and provide accessible goods and services to customers with disabilities. Employees will become more sensitive to the challenges of customers with disabilities and attentive to potential barriers and problems.